Once a month 8pm-7am Queer Friendly party night Potato Cake takes over the Public Bar with bands and DJs til 7am! 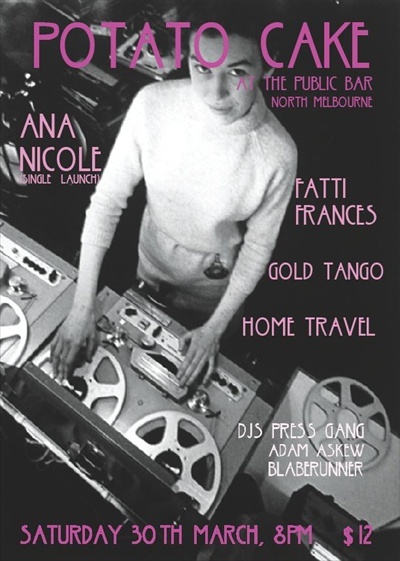 This month's party serves up Ana Nicole (launching their new single 'Mainlining'), Fatti Frances, Gold Tango and Home Travel (members of Eastlink and Absolute Boys). DJs till 7am. Blaberunner is on early, Press Gang at 12am. I'm playing lucky last... 3am - close! Come down and get unstraight.